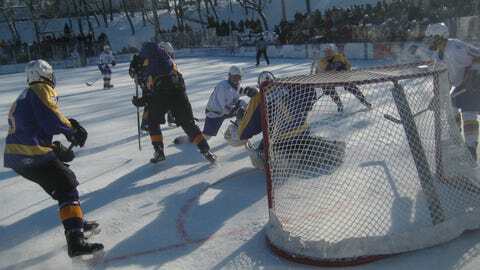 On Saturday Cloquet-Esko-Carlton improved to 6-10-2 and snapped a three-game winless streak thanks to its win during Hockey Day Minnesota festivities at Elk River. ELK RIVER, Minn. — Cloquet-Esko-Carlton coach Dave Esse took his time walking from his team’s bus into the picturesque Handke Pit on Saturday. Taking in the scene, he recalled childhood memories of skating in a similar setting. "I wanted today to be a special day," Esse said. With a four-goal outburst in the third period of Hockey Day Minnesota 2014’s inaugural contest, his Lumberjacks team took care of that. With hundreds of bundled-up fans watching, Cloquet notched a quartet of unanswered markers — three in a near six-minute span — to hand Rochester Lourdes a 4-1 defeat on outdoor ice inside Elk River’s naturally-formed valley. Lumberjacks captain and leading scorer James Newgren had back-to-back goals to close out the morning contest, and Jack Kuhlman’s rebound stick-back at the third period’s 5:52 mark proved the eventual game-winner. That allowed Cloquet, a three-town cooperative out of the Lake Superior Conference, to improve to 6-10-2 and snap a three-game winless streak. Independent private school Lourdes (3-12-1) lost for a fourth time in six outings. But even Eagles coach Josh Spaniol couldn’t hang his head afterward. "The loss doesn’t mean much to us right now," the coach said. "This is just an experience that these guys have worked so hard for." Things looked good for the Catholic institution out of Rochester when forward Peter Alexander took a pass from defenseman Tyler Vehrenkamp and beat Cloquet goalie Zack Strom (nine saves) 1 minute, 45 seconds into the final period. Lourdes played most of the game in its defensive zone but received a stout goaltending effort from Jack Burkel, who manned the crease the first two periods and stopped all 23 shots he saw — 14 in the second frame alone. But Spaniol wanted backup netminder Aaron Van Galder to experience the Hockey Day atmosphere and allowed him to play the third period. He was credited with only one stop. "That was a choice I made," Spaniol said. "On a day like this, you want to get everybody you can in there." According to Newgren, Alexander’s goal knocked some of the cobwebs present in the first and second periods loose. "That’s gonna wake anybody up," said Newgren, a senior juniors prospect who now has 19 points on the year. "We fixed some small mistakes and started putting the puck in the net. Vehrenkamp went off for tripping almost immediately after the Eagles took the lead. A deflected Ryan Lind shot from the left point knotted the score about 90 seconds later. On another power play, Kuhlman shoved home a rebound after Van Galder thwarted Dylan Johnson in the slot. Newgren added a 4-on-4 flip over Van Galder and an empty-netter that put the game to rest with 46.7 seconds to go. Like his coach, Newgren was happy to get a little lost in the moment. "Oh my gosh, it was awesome," Newgren said. "Pretty much any kid, if you play hockey, (Hockey Day) is what you wanted to play in growing up. I remember watching the games when I was younger, and it was just something I always dreamed of."